I've decided to make a memorial quilt with last mourning hearts. Today I've done a piece like this. 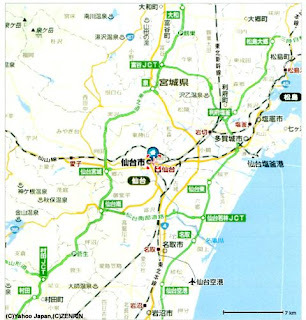 As you may see, this is a map of east coast line of Tohoku Region where was affected by quake, tsunami and nu-clear plant accident. Two red beads shows the hypocenter and nu-clear plant. I put pearl beads as cities/towns. 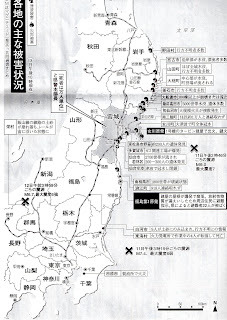 Three flower beads shows three cities where local goverment offices are; from top, Morioka (Iwate prefecture), Sendai (Miyagi prefecture), Fukushima (Fukushima prefecture). It's the third week has started since the day of March 11. Still TV news pains our hearts everytime, everyday. The nuclear plant in Fukushima is also still our most biggest concerns. Those are mourning hearts I pieced today. 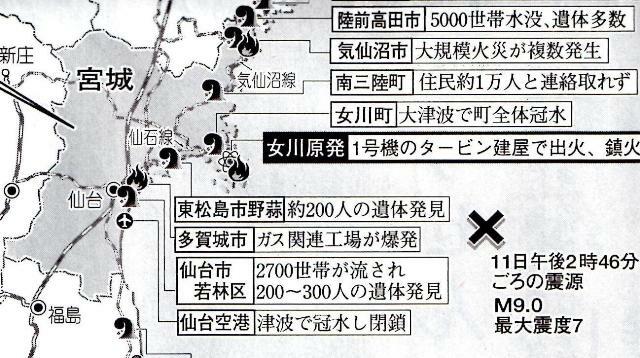 Fukushima Prefecture: 948 victims, 5,723 people missing, 86,313 had to flee from the nuclear plants. 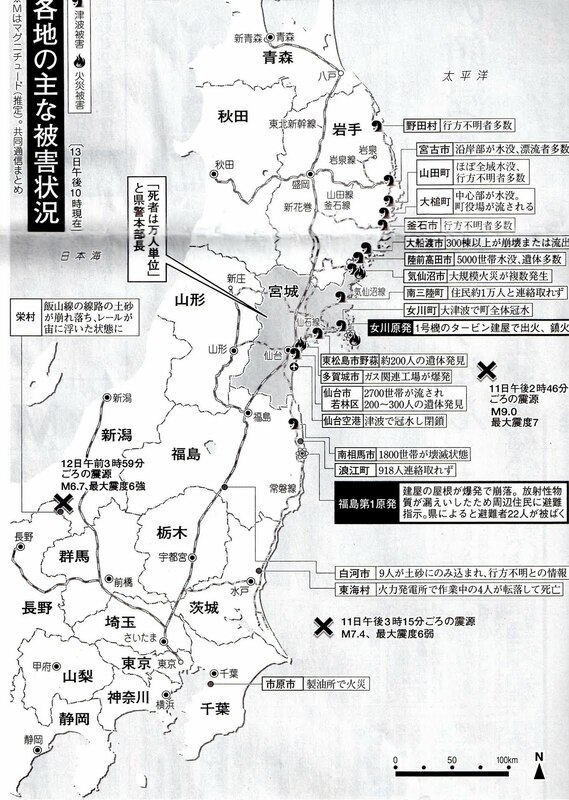 My uncle and aunt have died in those hard days in each living place though theirs were not caused of quake nor tsunami. I really appreciate CQ friends' support from oversea. I am also thinking to make goodies for charity. That must be what I can do here now. When I found power and telephone lines were stopped just after the quake, I got the information by my mobile phone's TV service. And the corresponding by mails were available for communication with outside. I had happened to buy a very useful goods which could be used as radio, handlight, alarm and mobile charger worked by turning handle. This old radio was useful to get informations. Though still we can't take bath nor shower, we boil hot water with this big pan and wash ourselves to keep cleanliness at the least. Finally I've finished clearing up each rooms of my house somehow. For years we had been warned a big quake would happen in this area. 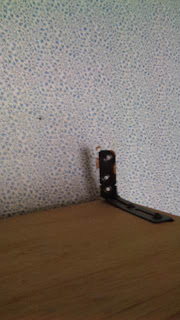 Though I am not a nervous person, still I had done something for that; for example to fix furnitures/shelves. Here are some pictures of them. You can see fitting metals are shifted from the first poit, though it stopped the shelf to fall down. 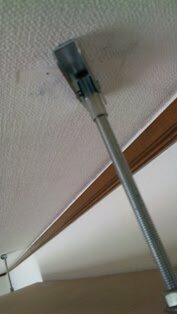 The screws are come out of wall. But it must have saved six minutes while it was shaked with intensity 6+. This time shaking was happened in south-north direction. 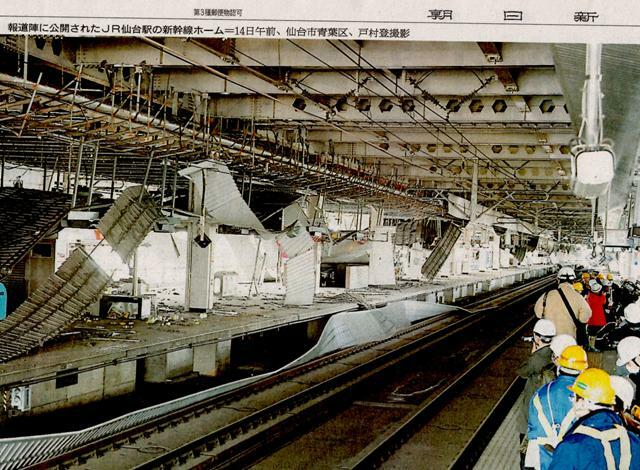 Therefore the things faced east-west were not damaged much. 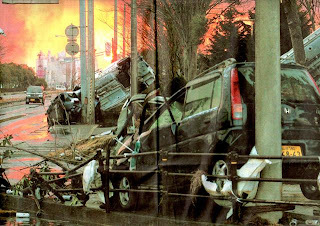 Slowly the situation of our life is taking back normality except the nuclear plant accident in Fukushima. It remains still in crucial condition in spite of the hardest efforts. 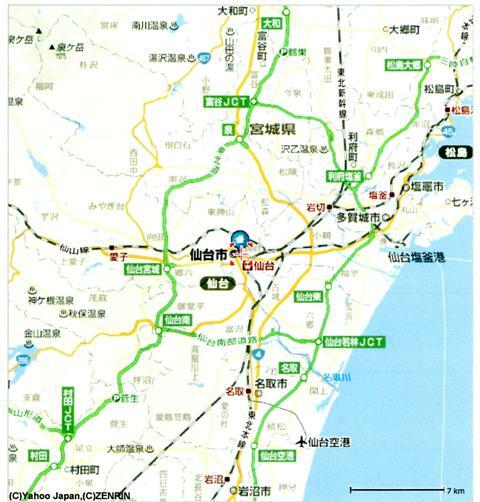 Sendai is located about 100km far from the place. I've never been positive with nuclear plant. I am not a scientist. It's only my sixth sense but I have always thought human's work is never perfect. But still I have to admit I've been enjoying advantages of today's technology. It must be a turning poit for us to look over our civilization again. This photo was taken in 1999. 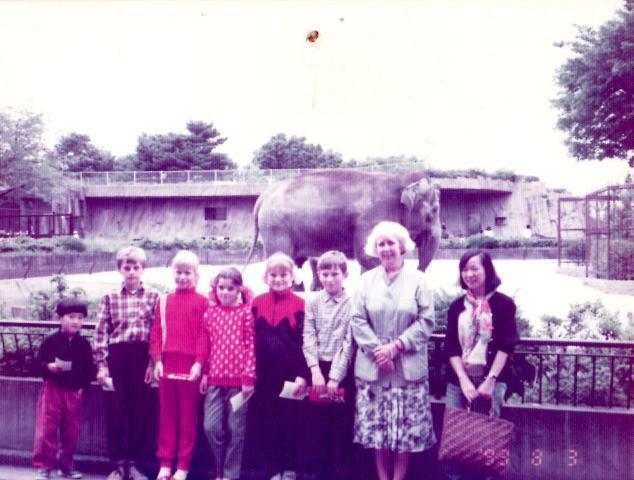 I am standing at the right. Childrens and a blond lady were from Ukraina. 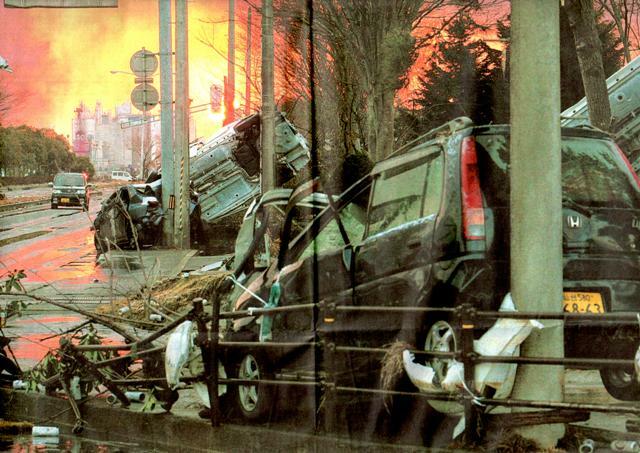 They had been affected by radiation out of the accident of Chernobyl. Then my friend in Sendai joined a project of "Summer Holiday to Children of Chernobyl and I helped her. We are in the same boat. 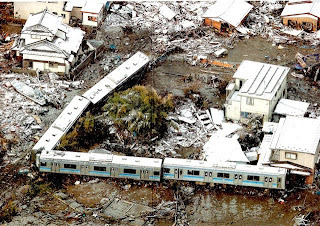 Earthquake and tsunami were nature disasters. 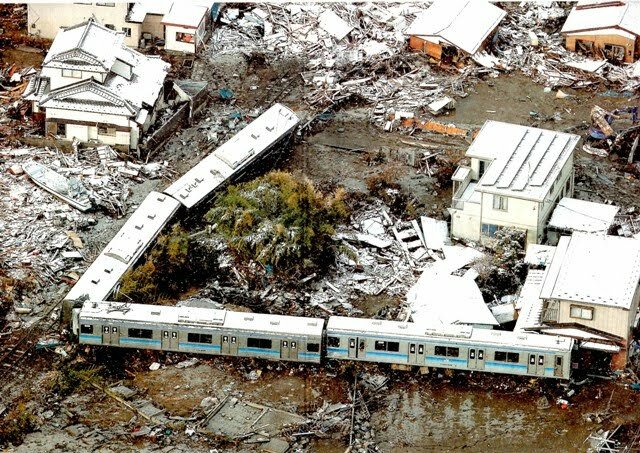 But I really hope young children not to be affected by the disaster caused by humans. This is a naked crazy quilt block by Diane in Canada. I really apreciate big supports and friendships of many CQers from all over the world. They quickly have started the project for us, Japan. My good friend, Leslie Ehrlich, one of the CQI moderators, is organizing the Hearts and Hands for Sendai project. She has already opened the flickr album. I've also received a kind e-mail from Lynn Schoefflor that CQMagOnline would take up the topic. 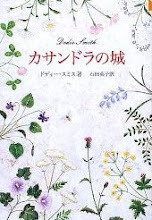 The editor of Patchwork Tsushin, one of the most wellknown quilt magazines is a graduate of same high school in Sendai as me. 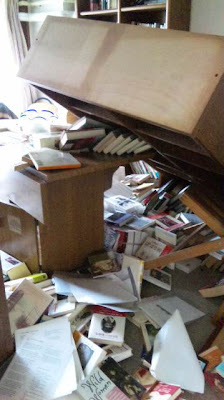 She, Ms Naomi Ichikawa says her family have been suffered by this quake. 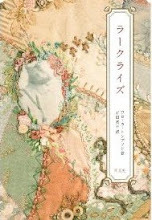 She's promised she would cooperate when the friendship crazy quilt is exhibiited in Japan. Around my PC corner in living room. Fortunately the PC didn't fall down then. A book shelf fell down. The quake occured at 14:46pm here. 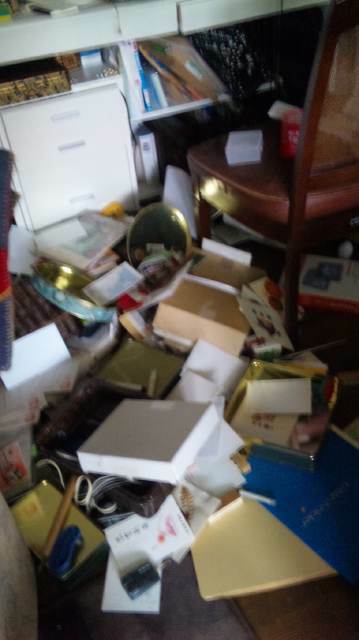 It was lucky at the least we had enough time to clean up to make a space for life and draw out some goods for survivals, ex. candles, handlights, radio, tins, etc before it got dark. Sendai is the most biggest city with one million population in Tohoku(North) region of Japan. It is the center of business, eduaction, local authorities and etc in this area. Now transportation functions are stopped. 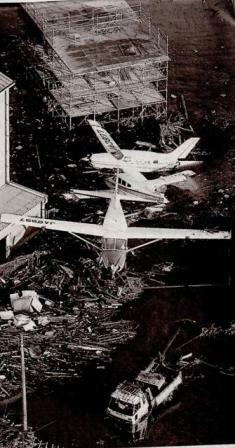 Followings are photos from newspapers. The station is about 20 minutes walk from my house. My husband had luckily flied back from Nagoya in the morning of the day. As you see buildings didn't get s serious damage around here, fifteen minutes walk from my house. People is making 1 kim long line to buy foods. Donna & Jonathan, Carlton & Katie, you may guess the situation. 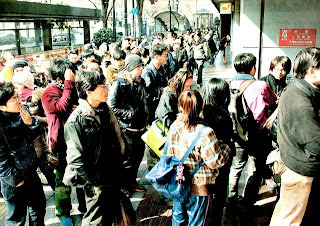 The line started from Mitsukoshi towards Daiei, which was opned for two hours then. This photo is not of Sendai but Nobiru, coast town, where my husband's uncle and his family live. What a relieve for us we've heard they are all alive, though their houses were completely destroyed by tsunami. Today is my biirthday. It's snowing, very cold. I appreciate all the concerns, thoughts and supports from all over the world. As you must have already known through media news, last Friday afternoon at 14:46pm in Japan, we Japanese were hit by the most biggest earthquake in these 1000 years history, it's said. It's horrible. Though my family and I are safe. Here are three maps. 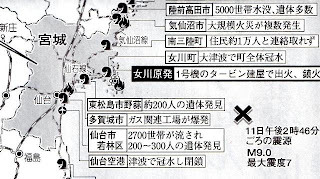 If you can't read Japanese, guess the geographical informations. We live at the point, far from the coast fortunately. But there are friends and relatives we can't get in touch. I've finished my very old UFO. Many years ago I planned to make a crochet needle case, pieced the front block and finished the inside, but left it. I started this project to use up the left-overs of following wall hanging. Can you see my stiching of 2003? Now you know how many years have passed away by now. 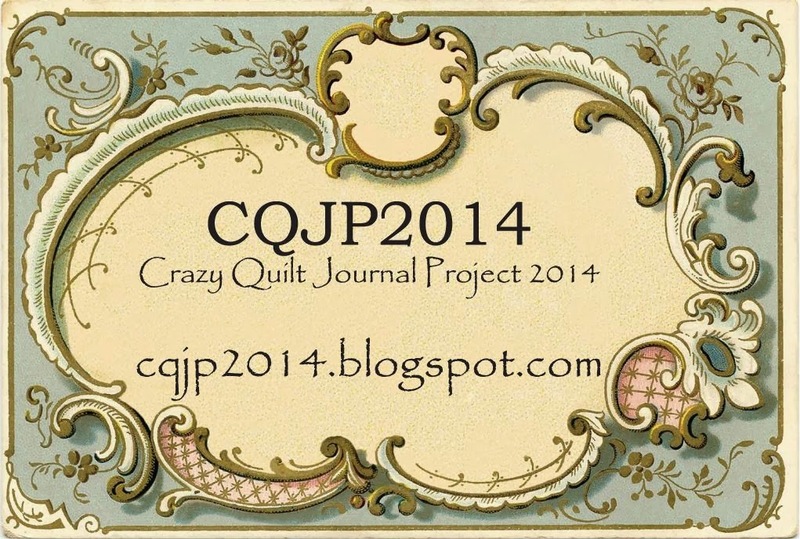 The CQI has an International Flag Project this year. I am an only member who is joining the group　from Japan, so I couldn't escaped from it. 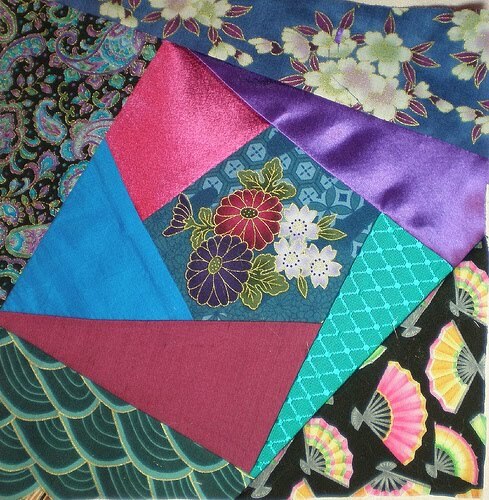 Here's Japan flag block I have pieced.